DONNA Lynch always wanted to work in radio, although growing up in the Snowy Mountains she could not have imagined where her passion and trailblazing spirit would lead her. “As a girl I would talk into the garden hose, pretending it was a microphone,” she said with a grin. As a primary student at St Patrick’s Parish School, Cooma, Donna would organise fundraising concerts with the blessing of the Brigidine Sisters who tendered her faith and encouraged her talents. “I am always proud to be a Catholic and to be of our faith, and I struggle to understand how someone cannot believe in God,” she said. Donna poured her efforts into school charity shows – miming pop songs, writing and producing plays and singing to bring in a crowd. “We would charge the kids two cents to get in and we would donate the money to the missions,” she said. Even though Donna thrived on talking, entertaining and fundraising, her father Michael considered a career in radio was a frivolous pursuit. “He was a hard worker for the Snowy Mountains Authority, from good Irish stock and one of five brothers – John, Jim, Tom, Michael (my father) and Patrick. For him, radio was a dime-a-dozen,” she said. “Mum’s from a family of ten, and Mum’s father was an original man from Snowy River – a drover. There are photos of him droving horses through the Snowy River with the snow peaks in the background and the horse’s head just above the water. When Donna was 15 she left school, learnt shorthand and typing, and then joined a local accounting firm. It could have been the start of a settled life, but Donna had other ideas. Three years later, at 18, she saw a chance. She volunteered to present an International Women’s Day broadcast at Cooma’s radio station 2XL. “I was friends with the announcers because I used to go and do work experience and hang around the radio station,” Donna said. “So I got time off from my accountant boss and came into the radio station for the 9am-noon shift and played all women’s songs. A few more months later a full-time job at 2XL came up and Donna got the job. In 1982 Donna moved to 2CC in Canberra where she was employed as a secretary. “They didn’t employ female announcers at the time, so I had to get a foot in the door,” she said. 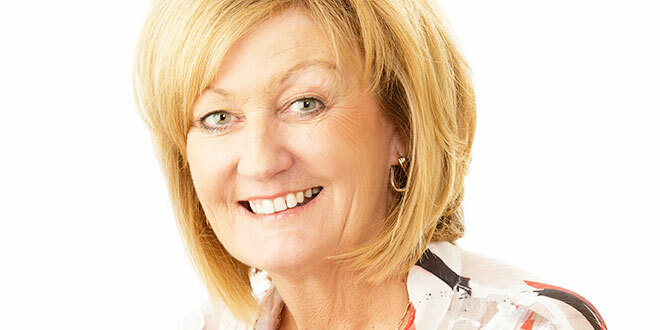 Donna created history when she was asked to co-host the Canberra breakfast show. “We were the first female-male breakfast show in commercial radio in Australia,” she said. Donna moved to Brisbane in 1988, the year the city hosted Expo. “Brisbane grew up that year. Canberra was stuffy, Brisbane was laid back and easy and I love the weather. And my mum and dad had moved up before me to the Gold Coast,” she said. She joined Brisbane’s 4BK which became B105 when the station was launched on the FM band in 1990. “I was just doing odd shifts and then they decided they needed a breakfast show so they put me on air with Ian Skippen and Jamie Dunn,” Donna said. It was the start of a radio legend. 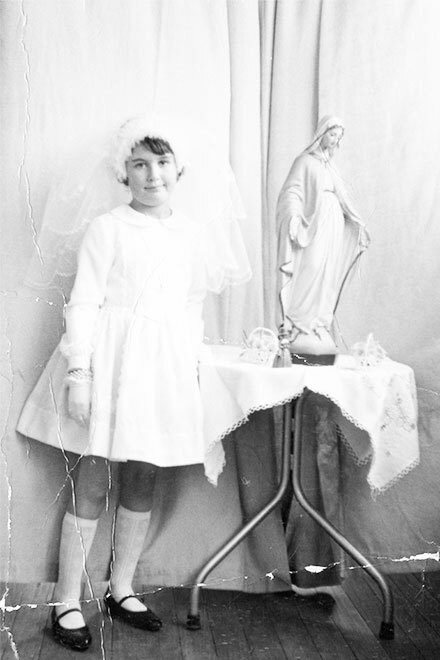 Memories: Donna Lynch on the day of her First Holy Communion. The B105 Morning Crew led the breakfast time slot ratings until the end of 2004 – for about 115 consecutive radio surveys. The Morning Crew became a Brisbane institution, with Donna becoming a household name. She stayed with the Morning Crew from 1990-96, using her celebrity to host and organise charity events, raising money for a variety of causes including the Children’s Hospital. Despite the on-air success, Donna admitted the early-morning shifts presented a personal challenge. “I could not stand getting out of bed in the morning,” she said. “I am not a morning person. And to think I did breakfast radio for so many years always amazes me. It didn’t quite happen the way Donna had expected, but she has not regrets. After six years at B105, she was sacked. “In our industry so many of my dear friends lose their jobs. They haven’t done anything wrong, it’s just the nature of our business,” she said. “One door shuts and another door opens. I went straight to 4BC. “It was a culture shock because I was always in music radio, but this was talk radio. “I was so nervous on my first shift, it was like starting over again. Over the years, Donna has shown just how adaptable she is as a multi-media performer. She has hosted a children’s TV show in Canberra, worked for Channel 9 in Brisbane as a reporter for a lifestyle program and was one of the original hosts on the Queensland edition of The Footy Show. Donna has spent a lot of time hosting various charity luncheons, sporting functions and shopping-centre events. The Mardi Jackson Cancer Foundation Ladies Luncheon is one of the ongoing charity events closest to Donna’s heart. The foundation makes numerous donations in support of melanoma treatment and research. “It has been going for about thirteen years and we have raised over $100,000 for this charity, (Mardi was a friend),” Donna said. Donna downplays her own achievements. Instead she likes to highlight the wide variety of stars she has interviewed or met – Phil Collins, Elton John, Michael Buble, AC/DC, Barry Gibb and Charlton Heston, to name just a few. She counts Broncos coach Wayne Bennett as a mentor and friend. “Interviewing has been a very exciting part of my life where you never fail to pinch yourself,” she said. Donna admits that one of her biggest thrills has been visiting Vatican City– not once but “five or six times”. “Growing up in Cooma I never dreamt I would get out of New South Wales let alone go to Rome and the Vatican,” she said. “I am overwhelmed every time I go there. “And I defy anyone who doesn’t believe in God to go to the Vatican and not be affected. “I go there and say my prayers. It is cleansing. I think Rome gives me the feeling that our religion lives. These days Donna can be heard on air each weeknight on Magic 882. Her 6pm-to-midnight program is broadcast into Brisbane, Sydney and Melbourne. She divides her time between Brisbane and the Gold Coast where she lives with Colin, her now-retired, long-time partner. Donna attends church in Broadbeach and although she doesn’t have children of her own, she admits to doting on her many godchildren and enjoying the pleasures of big events with family and friends, particularly at Easter and Christmas. Listen to Donna Lynch on Magic 882 weeknights from 6pm to midnight from Monday to Friday.